Sometimes, all you want is a burger and fries. 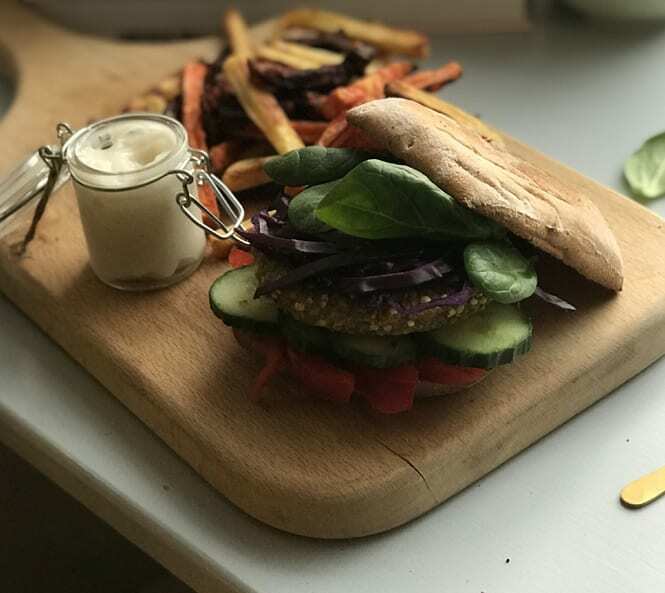 Our Kale & Quinoa burger offers a vegan alternative to the classic staple and the Mixed Root Vegetable Fries provide plenty of fibre and a natural, earthy flavour. Top with egg-free mayo for a protein-packed vegan meal that will satisfy that burger craving in the best way possible. Cook the Mixed Root Vegetable Fries and Kale & Quinoa Burgers as per instructions on the pack. In the meantime, slice the cucumber, pepper and red cabbage. Serve with a side of egg free mayo for dipping. Dig in!